Battery storage will power your future electric car charging-point too when that day comes when EV technology (electric vehicles) finally arrives on your driveway. You’ll quite literally be going, Back to the Future by adopting PV and EV-technologies into your current 20th-century life. PV and battery storage technologies are becoming a growing statement that the current costly model of powering our home just doesn’t cut it anymore. 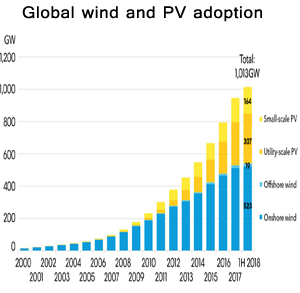 Today, the world passed a 1,000 GW of wind and PV solar with China alone installing 24.3GW of solar power in the first half of 2018. An exponential curve despite the United Kingdom’s best efforts to put the sunshine-loving cat back into the bag. Despite this, British Gas lost 340,000 customer accounts to alternative energy suppliers after recent bill hikes. It’s only a matter of time before these bill payers run out of energy companies to run away from and then alternative technologies will be the only alternative. Stupidly, Britain allowed itself to fall behind the rest of the world in recent years technologically, morally and with a failing privatised energy industry moreover, now risks energy insecurity for vast swathes of its population. Sadly, our recent government allowed influence from subsidy-hungry oil and gas interests alongside Chinese-state investors at Hinkley Point C that will push-up energy bills even further looking forward. PV roll-out was temporarily delayed as PV-tech subsidies were redirected. Despite our government’s attempt to block alternative forms of energy, basically, to keep the population dependant on a dying centralised model, the world around us is changing anyway. The rest of the world is responding to global climatic threats by growing PV, EV’s and battery storage capabilities alongside a growing divestment movement. Britain has literally become the grumpy-old-man of Europe refusing to trade-in his horse and cart as the world around adopts the new-fangled motor vehicle? PV solar panels and battery storage technologies are a growing statement that the traditional centralised-model of powering our homes simply don’t cut it anymore. People and commerce are going their own way were energy are concerned is the only valid way forward. As an example, B&Q will be installing a 756kW of battery storage system to complement their existing rooftop PV solar system currently installed at the B&Q distribution centre. PV solar farms are beginning to be installed without the need for government subsidy too. A 496,000 unit solar farm is under construction and will be the biggest in Europe. PV technology is already competitive without subsidies. At last the precipice has been bridged. Forward-looking, we’ll be the last generation to be wholly dependant on the current centralised energy model, but it hasn’t gone down without a fight as the last five years in the United Kingdom has demonstrated. A new era of private enterprise driving PV-tech forward has begun, and I would go as far to say that a quick deployment worldwide is the only way to prevent societal collapse as global heating starts to affect our industrial-scale food industries – again looking forward. PV and battery storage go together like a horse and carriage. New world technology with an old-world twist. At the turn of the last century, people had to decide to transcend from one horsepower to the motor-powered vehicle. Our generation is now at that same decision-making point with PV and EV-technologies in our own century. Powering the home with today’s ‘switching’ culture is no longer an option for more astute people. Today, we’re in a deteriorating culture reliant on huge subsidies at the expense of essentials such as schools, law and local services. Those that can afford to invest in PV and EV technology for the next thirty years of life should do so. It’s a financial no-brainer personally, nationally and globally. A PV solar panelled battery storage installation in England could increase solar consumption to the point that no power will draw from the grid on some days of the year. If you can’t afford to purchase a full PV and battery storage setup (that today is half the costs of even five years ago), then building up a system in incremental stages is an excellent place to begin your PV-powered future. Firstly, a PV solar panel installation is a place to begin. Once you’ve discovered the full potential of the sun, then upgrading with a battery storage device to maximise even further can come later. As you prepare for the national energy costs to hit the roof (excuse the pun) at any point in the next three decades (lifespan of PV), suddenly your PV-purchase begins to look like the smart piggy building his home from bricks in a world full of Wolves. Within this period, the EV market should begin to mature, and so when it’s time to replace your old gas-guzzler, an EV-charged by PV system starts to look tempting. Three simple steps towards a secure energy future in a nation, so desperate for energy they are going to poison the water tables with Fracking to keep you laying their golden eggs like a battery hen – now that’s crazy. We’ve now entered a period that’s turned a full 180-degree when installing solar panels is the smarter man’s option and relying on ‘The Man’ is now plain stupid. Switching providers are nothing more than ‘reinforcing a negative’ personally, nationally and globally. One hundred and fifty years of continually reinforcing negatives have brought our civilisation to a situation were fully stocked supermarkets could become a distant memory. Industrial-scale farming brought down by climate collapse is now a real and present danger. A thin veneer of electrons comes between you and chaos. Energy prices aren’t ever going down, so welcome to the sane world of PV solar panels with battery storage for the long and costly road of wholesale energy price rises ahead. Time to consider EV-powered PV for the road ahead. Continue to beat your mule or finally join us in the 21st-century.